Within the past thirty-plus years, Sigrun Biesenbach-Lucas has taught English as a Second Language (ESL) as well as Linguistics at Georgetown University and at George Washington University. She received both her MAT (1986) and PhD (1994) degrees from Georgetown University. She has been teaching ESL/EFL courses in Georgetown University's School of Continuing Studies' English Language Center (formerly the Center for Language Education and Development - CLED) since 2006. Dr. Lucas typically teaches advanced level classes – particularly those focusing on Reading/Writing/Research. In addition, she serves as the Program’s College Applications Advisor and works with students in the Intensive English Program on their graduate and undergraduate university applications. Since 2010, she has also taught a special preparatory course, "Communication Tools for Success", for students accepted to Georgetown's McDonough School of Business. Dr. Lucas has co-authored a grammar textbook for English language learners - Next Generation Grammar 4, published by Pearson; it is a hybrid, blended course combining the traditional student book with an innovative online component for students and teachers. She has also worked with Oxford University Press on a variety of textbook projects and co-wrote the discussion board components for Oxford's Q Skills series. Before joining the EFL faculty at Georgetown in 2006, Dr. Lucas taught in the TESOL Teacher Training Program at American University, teaching graduate level courses in ESL methodology/materials design, second language acquisition, grammar teaching, and TESOL research. In 2006, she was recognized as a World Teacher Honoree for outstanding teaching by the TESOL International Association. Dr. Lucas has conducted extensive research, focusing on how technology, specifically e-mail, affects language use and pragmatic differences between native and non-native speakers of English in student-professor interaction. She has also investigated the effectiveness and usefulness of asynchronous discussion board interaction in higher education. In recent years, her foci have been on ESL/EFL pedagogy, particularly writing instruction and integrated skills projects, as well as on program administration. She has conducted workshops on teaching related themes, as well as on hiring and preparing application portfolios. Additionally, she has developed and implemented an ESP course at a major Washington hotel. Dr. Lucas is a member is several professional/academic organizations, among them TESOL and WATESOL, and she was the Local Chair of the 2008 AAAL Convention, held in Washington, DC. Dr. Lucas has presented at numerous international, national, and local conferences; and she has published articles in Language Learning & Technology, Computer Assisted Language Learning, and the Journal of Asynchronous Learning Networks, among others. She has served on the Editorial Board and as Reviews Editor for Language Learning & Technology, a peer-reviewed academic journal. She is regularly invited to review manuscripts for other academic journals, and she is invited to participate in publisher focus groups to evaluate potential teaching materials. Dr. Lucas has also been a site reviewer for the Commission for English Language Program Accreditation (CEA) and has reviewed English language teaching programs throughout the US. She served as the Georgetown EFL Program's CEA Self-Study Coordinator for the program's latest re-accreditation in 2014, and she currently oversees compliance with all CEA related matters. 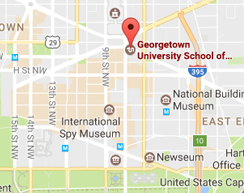 In addition, Dr. Lucas has served in Georgetown University's Alumni Admissions Program for about 20 years, interviewing undergraduate applicants to Georgetown during each admissions cycle. In her – relatively little – free time, Dr. Lucas enjoys exercising, yoga, and walking, or traveling to the Eastern Shore with her husband. She has two grown-up sons.